Saturdays and Sundays: free, with the exception of the "reserved" spots closest to Hennepin Ave. Parking is also free during funerals, with the exception of the "reserved" spots closest to Hennepin Ave.
"Reserved parking" spots in this lot are marked as "reserved" and are paid spots for nearby businesses only. Please note: some spaces are reserved for Handicapped parking. 1420 Hennepin Ave S. (north side of Hennepin Ave). A "pay-as-you-enter" mechanical system requires payment before entering the ramp. Please note: $5 during special events in Loring Park and Holidazzle. Right turn only from Hennepin Ave. It is illegal to turn left into the MCTC parking ramp from Hennepin Ave.—the Minneapolis Police department actively enforces this restriction. Right or left turn from Laurel Ave. 1 block north of Hennepin Ave. between 15th and 16th St. on the north side of the building. 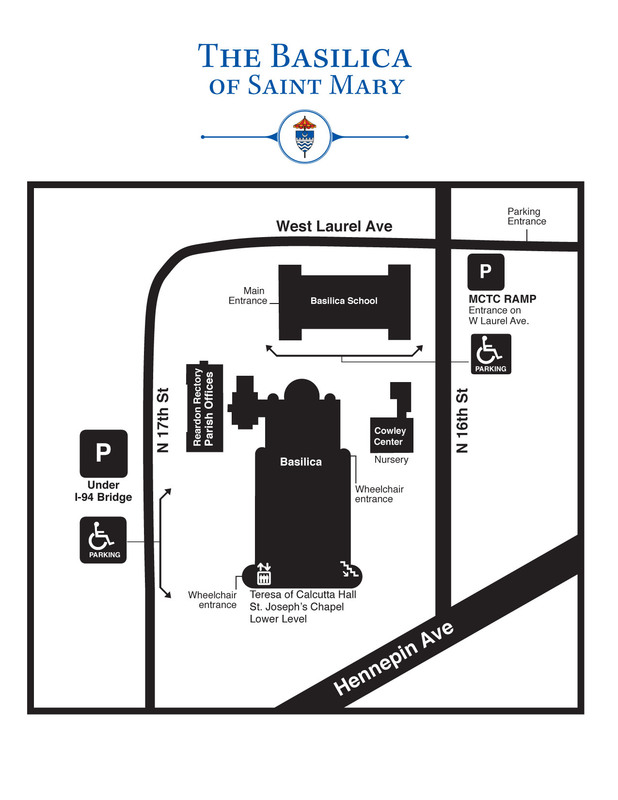 ​Download/View a map of the Basilica campus. The City of Minneapolis is rebuilding the Hennepin Avenue corridor between Washington Avenue and 12th Street. The Spruce Pl bus stop near The Basilica will remain open. Visit the Metro Transit website for more information. Information regarding road construction throughout the Minneapolis/St. Paul region as well as the state can be found on the Minnesota Department of Transportation's website. For a listing of the weekend-specific impacts, visit MNDoT website.